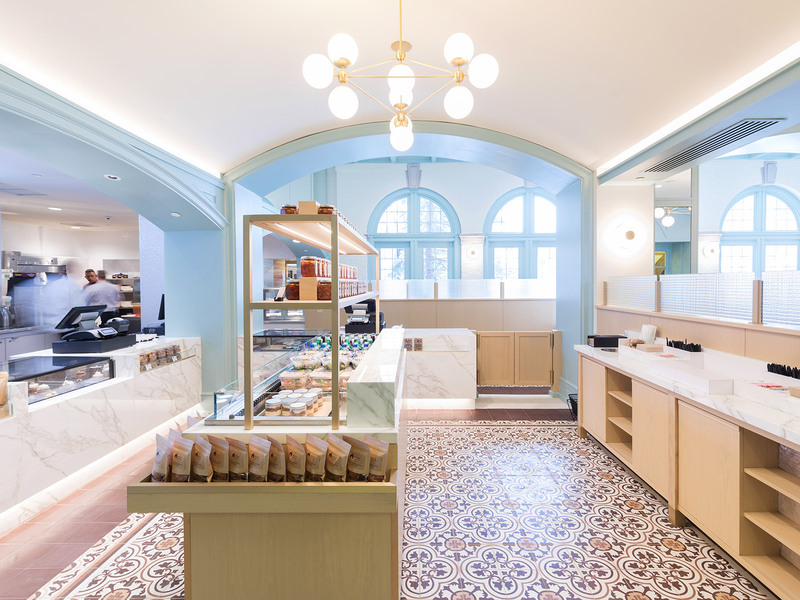 The school's casual Apple Pie Bakery Café just received a significant upgrade, and if you've never been, now's the time. For anyone who cares about food even a tiny bit, a visit to the Culinary Institute of America is always a great idea—dropping by the school's world-famous Hudson Valley campus, barely two hours north of New York City, feels a little bit like boarding the mothership. For most people, making the pilgrimage has long been associated with a meal at one of the CIA's fine dining establishments, each one of them a training ground for (hopefully) the next generation of greats. For roughly twenty years now, however, the school has also been home to a decidedly less-involved dining experience that's never had any trouble drawing a crowd—the cozy, come-as-you-are, Apple Pie Bakery Café. The café, an all-day affair, began as a place to pick up pastries, sandwiches, coffee, and other quick bites; for most of its life, the Apple Pie was a relentlessly casual place, its popularity with faculty, students, in-the-know locals and day-trippers nearly always guaranteeing long lines. They'd pile in for great sandwiches, salads, crocks of macaroni and cheese, hearty soups, truffle fries, and entertainingly over-the-top desserts. The menu always felt as blissfully 1990's as the space itself, with its warm wood grains, soft lighting, cloth hangings and colorful tile floors. In any season, views out into the courtyard of Roth Hall, that historic pile at the heart of campus where the café is located, never failed to add to the experience. Stopping in for lunch was always great fun, but the café's immediate and unwavering popularity dictated that something, eventually, would have to be done to relieve overcrowding. So, it was not surprising to hear the long-overdue news, last year, that the Institute would be shuttering the space, in order to completely rethink things. Luckily, they had just the guys hanging around to help—designer Adam Tihany is known around the world for his restaurant interiors, but he has also been the Art Director at the Institute since 2011; Chef Waldy Malouf, famously the chef-owner of Manhattan's Beacon Restaurant for many years, is now the CIA's head of food and beverage operations. After a few short months and with few details leaked along the way, the Apple Pie Café reopened to the public this week, just hours before the beginning of an epic snowstorm. It didn't matter—everyone showed up, and even though they had to close for a day in order to dig out, everybody who hadn't come on the first day seemed to be there waiting, the moment the roads were cleared. Stepping into the reinvigorated space feels like a first visit to a new restaurant, one you're pretty sure you're going to love. Gone are the cloth hangings, the bare wood, the low light—everything is bright, light, freshly painted, more vibrant, more lively, but no less warm and welcoming. Waiting in line for your lunch is no longer necessary, and that's perhaps the most important change—for anyone dining in, there's now table service, and quite good table service at that. Grabbing and going can still be done, but the counter area has now been broken out as a separate section. Essentially, where there was once one venue, there are now two. The menu features many of the same classics—the seasonal soups are still there, the other day, a cold weather-appropriate cauliflower puree seemed to be on most tables. The macaroni and cheese ($13) is recognizable, but appears to have received an upgrade—an oversized crock brims with cavatappi pasta, a sauce made with sharp, local white cheddar, and an aromatic persillade. There's some seriously fancy food, too—an artfully-done poke bowl ($14), a many-textured root vegetable salad ($11) that’s magazine cover-ready, a fascinating starter that's essentially a baked beet volcano erupting crème fraiche, showered in savory granola ($6). 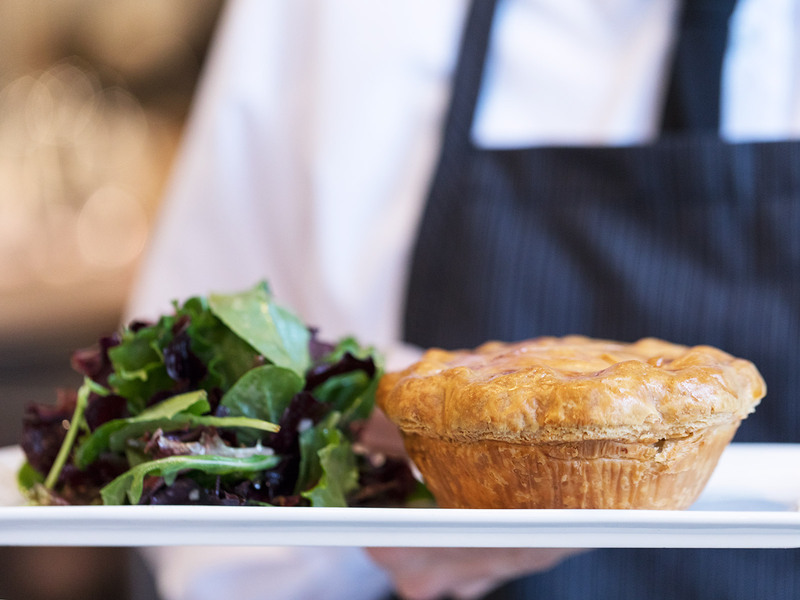 Back on the comfort side of things, the chicken pot pie ($14) is perfectly rich, with a sneaky (and welcomed) cheesy pastry crust; of course you can, like always, get the quiche of the day with a little side salad. The selection of desserts ($7) is almost longer than the list of main courses, and every single one of them seems ready to fight the other for pride of place in a Parisian patisserie. Place mats on the tables provided a key to two new art installations, walls of china plates decorated with caricatures of various food celebrities from throughout the years. Here you will see everyone from Fannie Farmer and James Beard to René Redzepi and Enrique Olvera; an extensive drinks menu includes on-tap beers from the in-house brewery, located down by the Hudson River, inside the envy-inducing student center, which is open to the public on weekends. While the café is now a proper restaurant, you don't need reservations for lunch—you just need to be aware of the hours: Monday through Friday only, while classes are in session. And if they're really busy, no worries—there's always takeout. 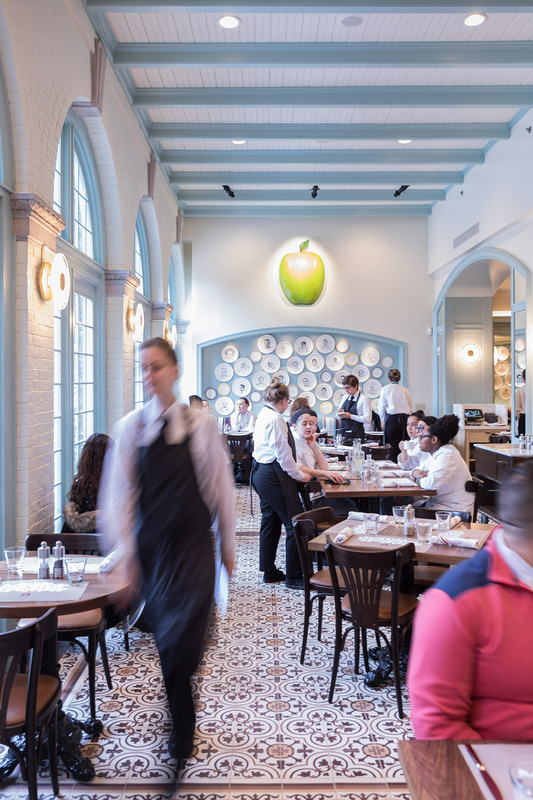 The Apple Pie Bakery Cafe is located at the Culinary Institute of America in Hyde Park, New York; for more information on the restaurants located at CIA campuses in New York, Texas and California, visit www.ciarestaurantgroup.com.